The Conca Tolmezzina commercial and tourism revitalisation project was realised with state and regional funding under Law 266/97. Assisted by specialized consultants, the local governments involved have undertaken to strengthen the territory’s tourist orientation, proposing communication tools for accommodating and informing visitors on the main attractions of the area, leisure time pursuits, places to stay, where to eat and shopping. 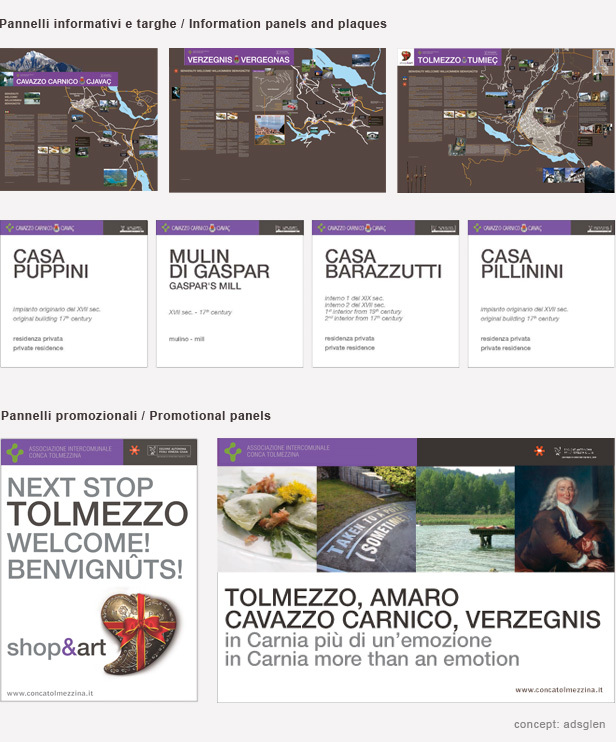 The project idea was therefore implemented in a series of actions aimed at redevelopment of tourism and culture and commercial promotion of the territory of the four Conca Tolmezzina municipalities via in loco installation of panels and information signs for tourism and information purposes, installation of promotional posters within the regional territory, publication of paper format promotional material and setting up a website with new form and content, dedicated to the presentation of the territory and its resources.